Have you heard of the buying cycle? It’s the process that is involved when someone starts to think about making a purchase. There are a few stages to the buying cycle that you need to be aware of. The first stage is the customers awareness of needs. They know they need something but they are not sure what their options are. The next stage is the assessment of alternatives. The customer is now looking around and comparing prices, quality, service and reviews. They are in the research stage of their buying process. The next stage is the alleviation of risk. The customer has now almost certainly decided that they are going to make a purchase but need some assurances that they have made the right choice. They might need to be able to justify their spend to themselves or to a partner. They will also want to know that they are getting good value for money and that the choice is going to provide the solution to their problem. The next stage is the decision stage. Once the risks have been mitigated and the justification for purchase seems valid, the customer is then more comfortable about making the final decision to buy. The final stage is the achievement of results. The customer makes the transaction and pays for your product or service. 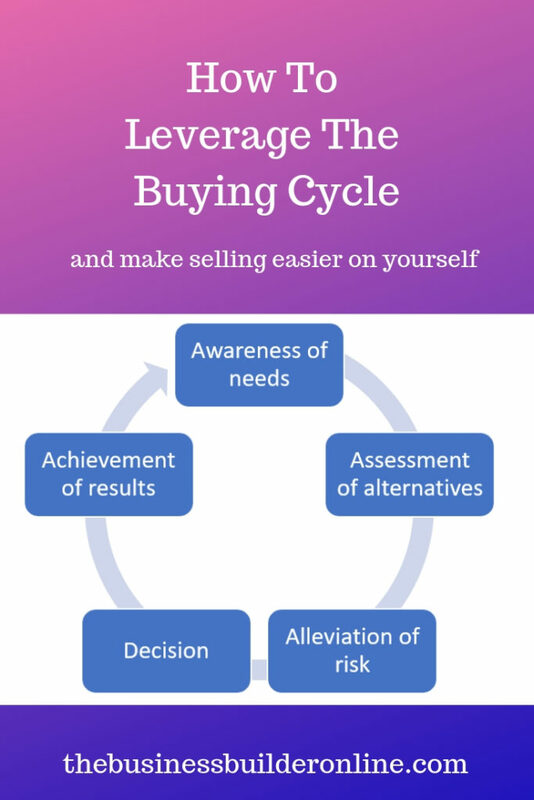 How can you leverage the buying cycle to make it easier to sell? 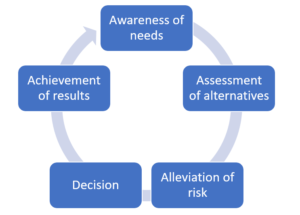 Okay, let’s take a step back and start at stage one of the process – awareness of needs. What is going on in the customer’s head at this stage of the process? The customer has a problem. They know they have a problem and they know they need to find a solution to that problem. The problem might be that their car has started to let them down, or their garden needs some new plants or their kitchen is outdated. It might also be a problem that is of a more personal nature such as needing relationship counselling or help with a technical aspect of their business. Although they are aware of the problem and they are aware that they need to fix the problem, they are not yet ready to actually buy something. At this stage of the process they are just aware that they “should” do something about the problem. They may not yet have decided what that something is. To leverage this part of the buying cycle you can inform your customer of the product or service that could help them overcome that problem. You are just making them aware of your product/services existence at this point. Trying to get them to buy when they are in this stage of the cycle is going to appear pushy. Don’t do it, you will put them off you forever! Instead, share information about your product or service on social media, or through a blog post like this one. Let people come across you naturally. This way they won’t feel that they are being sold to. Instead they will begin to view you as a possible solution to their problem. This will also help to move them on to the next stage of the cycle – assessing alternatives. This is the stage where people start to research what their options are. They might start getting quotes or asking for a consultation. They are weighing up the benefits of the various options to see which one is a good fit for them. Again, this is not the time to try and push your sale. They need to justify their decision yet, and they have not made up their mind at this stage whether they are actually going to buy anything. They are just weighing up their options remember. So what can you do to help the process? This is a great time to talk about the features and benefits of your product/service. The benefits should be customer focussed, what will they get out of buying your product? Again, you can talk about your product or service on social media and outline the benefits that the customer would get from making a purchase. Write a blog post and include testimonials or reviews of the product so that they can see how others have benefitted from it. This will help to move them on to the next stage of the buying cycle – alleviation of risk. Customers need to feel that they have made the right choice. They need to feel that their choice will deliver on its promise and solve their problem. If you start to talk about the benefits of your product you are helping them to alleviate these risks and justify their purchasing decision. The alleviation of risk process is where the customer objections come in to play. I can’t afford it at that price. I need to speak to my partner. I have to think about it some more. I’m not sure it’s the right fit for me. The more you can do beforehand to overcome these objections, the easier it will be to make the sale. It might be as simple as letting your potential customer know that you offer a payment plan, or that it comes in different colours or that you offer a full money back guarantee. Once the objections have been overcome the customer is then moving to the decision making stage. They are now ready to buy. Don’t make the mistake of trying to overcome objections or go over the benefits again as this will take them back to that stage of the cycle. Once the customer is ready to make the purchase be confident about asking for the sale. This shouldn’t be done in a pushy way but by asking questions such as “are you ready to sign the paperwork?” or “how would you like to pay”. You are acknowledging that the customer has already made up their mind to buy and are just asking for it to be finalised. Many of my clients find this last part difficult. Asking for the sale is never a comfortable conversion and I get this as I don’t much like it myself. We are not sales people we are plumbers, artists, cake-makers, coaches, book-keepers or VA’s. We are not trained in the art of salesmanship. The thing is, and you need to understand this and get used to it, if you are in business you need to be a salesperson. You need to learn and get comfortable with selling because selling is what is going to keep your business going. No sales, no business right? Most of us feel we are being pushy or salesy when we ask for money but hopefully now that you know the stages of the buying cycle you will know when it is appropriate to ask for the sale and when it isn’t. You will be able to gauge from your customers interaction with your business at what stage they are in their process and you will be able to converse with them in an appropriate way to help them move around the cycle. By the time the decision is made, if you have done this well, your customer will be asking you how and when they pay. If you are still worried about how to sell in a non-salesy way, why not come along to my 5 day course where I will be showing you exactly how to market the right thing at the right time to the right person. This course is for anyone who is looking to improve their online marketing skills and you don’t need to be technically minded to take part. I will help you implement the strategies we cover during the week into your business so there’s no need to worry about how to get it working once you leave. The course is limited to 4 people so that you get ample opportunity for one-to-one support should you need it. They are fun and friendly days where no question is considered stupid or unnecessary. The whole week costs just £350 per person and you can find out more about it here. I hope that learning how to leverage the buying cycle has given you inspiration to go out there and target your customers in the right way. I would love to hear how you get on and how much difference it makes to your conversion rates. Leave me a comment below. Previous PostPrevious What Social Media Platform Is Best For Business?